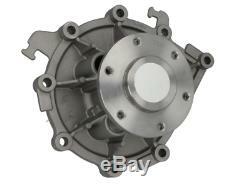 Water pump MAN EM, L 2000, LION S COACH, M 2000 L, M 2000 M, M 90, NM, SM, TGA, TGS, TGX D0824FL01-D2876LOH03 08.87. 8.103 LC, 8.103 LLC. 8.113 LC, 8.113 LLC. 8.113 LC, 8.113 LLC, LRC, LLRC(LE110C). 8.145 LLS, LLRS (LE140C). 8.145 LK, LRK, L-KI, LRK-L, LK-L, LR-KILK (LE140C). 8.163 LC, 8.163 LLC, LRC, LLRC, L-LF. 8.163 LC, LLC, LLRC, LRC (LE160C). 8.185 LLS, LLRS (LE180C). 8.185 LK, L-KI, LRK, LR-KI LRK-L, LK-L(LE180C). 8.185 LAEK, LAEK-L, LAERK, LAERK-L, LAK, LAK-L, LARK, LARK-L. 8.225 LLS, LLRS (LE220C). 8.225 LK, L-KI, LRK, LR-KI, LRK-L, LK-L (LE220C). 8.225 LAC, LAEC, LARC, LAERC (LE220C). 8.225 LAEK, LAEK-L, LAERK, LAERK-L, LAK, LAK-L, LARK, LARK-L.
9.145 LC, 9.145 LLC, LRC, LLRC (LE140C). 9.145 LLS, LLRS (LE140C). 9.145 LK, L-KI, LRK, LR-KI, LRK-L, LK-L (LE140C). 9.185 LC, 9.185 LLC, LRC, LLRC (LE180C). 9.185 LLS, LLRS (LE 180C). 9.185 LK, L-KI, LRK, LR-KI, LRK-L, LK-L (LE180C). 9.223 LC, 9.223 LLC. 9.224 LC, 9.224 LLC, LRC, LLRC. 9.224 LK, L-KI, LRK, LR-KI, LRK-L, LK-L. 9.225 LC, 9.225 LLC, LRC, LLRC (LE220C). 9.225 LLS, LLRS (LE220C). 9.225 LK, L-KI, LRK, LR-KI, LRK-KI, LK-L (LE220C). 10.145 LC, 10.145 LLC, LRC, LLRC (LE140C). 10.145 LLS, LLRS (LE140C). 10.145 LK, L-KI, LRK, LR-KI, LRK-L, LK-L (LE140C). 10.185 LC, 10.185 LLC, LRC, LLRC (LE180C). 10.185 LLS, LLRS (LE180C). 10.185 LK, L-KI, LRK, LR-KI, LRK-L, LK-L (LE180C). 10.185 LAEK, LAEK-L, LAERK, LAERK-L, LAK, LAK-L, LARK. 10.224 LK, L-KI, LRK, LR-KI, LRK-L, LK-L.
10.224 LAEK, LAEK-L, LAERK, LAERK-L, LAK, LAK-L, LARK. 10.225 LLS, LLRS (LE220C). 10.225 LK, L-KI, LRK, LR-KI, LRK-L, LK-L (LE220C). 10.225 LAC, LAEC, LARC, LAERC (LE220C). 10.225 LAEK, LAEK-L, LAERK, LAERK-L, LAK, LAK-L, LARK. 12.225 LC, LLC (LE220C). 12.224, 12.225, LK, LRK. 14.163 LC, LLC, LRC, LLRC. 14.255 LC, LLC, LLLC, LRC, LLRC, LLLRC (LE250B). 14.285 LC, LLC, LLLC, LRC, LLRC, LLLRC, (LE280B). 15.163 LC, LLC, LLLC, LLLRC, LLRC, LRC. 15.163 LK, LRK, LK-L. 15.255 LC, LLC, LLLC, LRC, LLRC, LLLRC, (LE250B). 15.255 LK, LRK, LK-L, (LE250B). 15.285 LC, LLC, LLLC, LRC, LLRC, LLLRC, (LE280B). 15.285 LK, LRK, LK-L, (LE280B). 18.255 LC, LLC, LLLC, LRC, LLRC, LLLRC, (LE250B). 18.285 LC, LLC, LLLC, LRC, LLRC, LLLRC, (LE280B). 18.285 LAC, LARC (LE280B). 18.285 LAK, LARK, LAK-L, (LE280B). 14.224 MAK, MAK-L, MARK. 14.264 MC, MLC, MLLC, MLRC, MRC, MLLRC. 14.285 MC, MLC, MLLC, MLRC, MRC, MLLRC (ME280C). 18.224 MC, MLC, MLLC, MRC, MLRC, MLLRC. 18.224 MK, MK-L, MLK, MLRK, MRK. 18.224 MAK, MAK-L, MARK. 18.264 MC, MLC, MLLC, MRC, MLRC, MLLRC. 18.264 MK, MK-L, MLK, MLRK, MRK. 18.264 MAK, MAK-L, MARK. 25.224 MNLC, MNLLC, MNLRC, MNLLRC, MVLC. 25.264 MNLC, MNLLC, MNLRC, MNLLRC, MVLC. 12.152 F, 12.152 FL. 12.152 FS, 12.152 FLS. 12.222 F, 12.222 FL. 12.262 F, 12.262 FL. 12.262 FS, 12.262 FLS. 14.152 F, 14.152 FL. 14.152 FS, 14.152 FLS. 14.162 F, 14.162 FL. 14.162 FS, 14.162 FLS. 14.192 F, 14.192 FL. 14.192 FS, 14.192 FLS. 14.222 F, 14.222 FL. 14.262 F, 14.262 FL. 14.262 FS, 14.262 FLS. 17.192 F, 17.192 FL. 17.192 FS, 17.192 FLS. 18.222 F, 18.222 FL, 18.222 FLL. 18.262 F, 18.262 FL, 18.262 FLL. 24.222 FNL, 24.222 FNLL, 24.222 FVL. 24.262 FNL, 24.262 FNLL, 24.262 FVL. 18.310, 18.320 FC, FLC, FLLC, FLLRC, FLLRW, FLLW, FLRC, FRC. 18.310, 18.320 FLLRS, FLLS, FLRS, FLS, FLS-TS. 18.310, 18.320 FK, FK-L, FLK, FLRK. 18.310, 18.320 FAC, FARC, FHLC. 18.310, 18.320 FALS, FARS, FAS, FHLS. 18.310, 18.320 FAK, FAK-L, FALK, FALK-L, FHLK. 18.350, 18.360 FC, FLC, FLLC, FLLRC, FLLW, FLRC, FLLRW, FRC. 18.350 FLLRS, FLLS, FLRS, FLS, FLS-TS. 18.350, 18.360 FK, FK-L, FLK, FLRK. 18.350, 18.360 FAC, FARC, FHLC. 18.350, 18.360 FALS, FARS, FAS, FHLS. 18.350, 18.360 FAK, FAK-L, FALK, FALK-L, FHLK, FHLK/M. 18.390, 18.400 FC, FLC, FLLC, FLLRC, FLLRW, FLLW, FLRC. 18.390 FLS, FLS-TS, FLLS, FLLRS. 18.390, 18.400 FK, FK-L, FLK, FLRK. 18.390, 18.400 FAC, FARC, FHLC. 18.390, 18.400 FALS, FAS, FHLS. 18.390, 18.400 FAK, FAK-L, FALK, FALK-L, FHLK, FHLK/M. 18.430, 18.440 FC, FLC, FLLC, FLLRC, FLLRW, FLLW, FLRC. 18.430 FLLRS, FLLS, FLRS, FLS, FLS-TS. 18.430, 18.440 FK, FK-L, FLK, FLRK. 18.430, 18.440 FAC, FARC, FHLC. 18.430, 18.440 FAK, FALK, FALK-L, FHLK, FHLK/M. 18.430, 18.440 FALS, FAS, FHLS. 19.350 FLRS, FLS, FRS, FS. 19.360 FLRS, FLS, FRS, FS. 19.390 FLRS, FLS, FRS, FS. 19.400 FLRS, FLS, FRS, FS. 19.430 FLRS, FLS, FRS, FS. 19.440 FLRS, FLS, FRS, FS. 24.350, 24.360 FLLRW, FNLLC, FNLLRC, FNLLRW, FNLLW. 24.350, 24.360 FPLS, FPLRS. 24.390, 24.400 FLLRW, FNLLC, FNLLRC, FNLLW, FNLLRC. 24.390, 24.400 FPLS, FPLRS. 24.430, 24.440 FNLLC, FNLRC, FNLLW, FNLLRC, FNLLRW. 24.430, 24.440 FPLS, FPLRS. 26.310, 26.320 FNLS, FNLLS, FNLRS, FNLLRS, FPLRS, FPLS. 26.310, 26.320 FNLC, FNLLC, FNLLRC, FNLLRW, FNLLW, FNLRC. 26.310, 26.320 FVLC. 26.310, 26.320 FVL-KO. 26.310, 26.320 FDC, FDLC, FDLRC, FDRC, FNHLC, FVHLC. 26.310, 26.320 FDS, FDLS, FDRS, FNHLS, FDLRS. 26.310, 26.320 FDK, FDLK, FDLRK, FDRK. 26.310, 26.320 FD-TM, FDR-TM. 26.310, 26.320 FVHL-KO. 26.310, 26.320 FDH-TM. 26.350, 26.360 FNLC, FNLLC, FNLLRC, FNLLRW, FNLLW, FNLRC. 26.350, 26.360 FNLS, FNLLS, FNLRS, FNLLRS, FPLS, FPLRS. 26.350, 26.360 FVL-KO. 26.350, 26.360 FDK, FDLK, FDLRK, FDRK. 26.350, 26.360 FD-TM, FDR-TM. 26.350, 26.360 FVHL-KO. 26.350, 26.360 FDH-TM. 26.390, 26.400 FNLC, FNLLC, FNLLRC, FNLLRW, FNLLW, FNLRC. 26.390, 26.400 FNLS, FNLLS, FNLRS, FNLLRS, FPLS, FPLRS. 26.390, 26.400 FVL-KO. 26.390, 26.400 FDC, FDLC, FDLRC, FDRC, FNHLC, FVHLC. 26.390, 26.400 FDLRS, FDLS, FDRS, FDS, FNHLS, FPHLS, FVHLS. 26.390, 26.400 FDK, FDLK. 26.390, 26.400 FVHL-KO. 26.390, 26.400 FD-TM. 26.430, 26.440, FNLS, FNLLS, FNLRS, FNLLRS, FPLS, FPLRS. 26.430, 26.440, FNLC, FNLLC, FNLLW, FNLRC, FNLLRC, FVLC. 26.430, 26.440 FDC, FDLC, FDLRC, FDRC, FNHLC, FVHLC. 26.430, 26.440 FDK, FDLK. 26.430, 26.440 FD-TM, FDR-TM. 26.430, 26.440 FDH-TM. 26.440 FDC, FDLC, FDLRC, FDRC, FNHLC. 26.440 FDLRS, FDLS, FDRS, FDS, FNHLS, FPHLS, FVHLS. 28.480 FNLC, FNLRC, FNLLC. 32.350, 32.360 FFDC, FFDLC, FFDLRC, FFDRC. 32.350, 32.360 FFD-TM, FFDR-TM. 32.390, 32.400 FFDRC. 32.390, 32.400 FFD-TM, FFDR-TM. 32.430, 32.440 FFDRC. 32.430, 32.440 FFD-TM, FFDR-TM. 33.350, 33.360 FDC, FDLC, FDRC. 33.350, 33.360 FDLRS, FDLS, FDRS, FDS. 33.350, 33.360 FDK, FDLK, FDRK. 33.350, 33.360 FDAC, FDARC, FDHC. 33.350, 33.360 FDARS, FDAS, FDHS. 33.350, 33.360 FDAK, FDARK, FDHK. 33.390, 33.400 FDC, FDLC, FDRC, FDLRC. 33.390, 33.400 FDS, FDLS, FDLRS, FDRS. 33.390, 33.400 FDK, FDLK, FDRK. 33.390, 33.400 FDAC, FDHC. 33.390, 33.400 FDARS, FDAS, FDHS. 33.390, 33.400 FDAK, FDARK, FDHK. 33.430, 33.440 FDC, FDLC, FDRC, FDLRC. 33.430, 33.440 FDLRS, FDLS, FDRS, FDS. 33.430, 33.440 FDK, FDLK, FDRK. 33.430, 33.440 FDAC, FDALC, FDHC. 33.430, 33.440 FDALS, FDARS, FDAS, FDHS. 33.430, 33.440 FDAK, FDALK, FDARK, FDHK. 33.440 FDC, FDLC, FDRC. 33.440 FDK, FDLK, FDRK. 33.440 FDAC, FDALC, FDHC. 33.440 FDALS, FDARS, FDAS, FDHS. 33.440 FDAK, FDALK, FDARK, FDHK. 35.310, 35.320 FFDC, FFDLC. 35.310, 35.320 FFDK, FFDLK. 35.310, 35.320 FFD-TM. 35.350, 35.360 FFDC, FFDRC, FFDLC. 35.350, 35.360 FFDK, FFDRK, FFDLK. 35.350, 35.360 FFD-TM. 35.390, 35.400 FFDK, FFDRK, FFDLK. 35.390, 35.400 FFD-TM. 35.430, 35.440 FFDK, FFDRK, FFDLK. 35.430, 35.440 FFD-TM. 37.310, 37.320 FFDC. 37.310, 37.320 FFDK. 37.310, 37.320 FFD-TM. 37.350, 37.360 FFDC. 37.350, 37.360 FFDK. 37.350, 37.360 FFD-TM. 37.390, 37.400 FFDC. 37.390, 37.400 FFDK. 37.390, 37.400 FFD-TM. 37.430, 37.440 FFDC. 37.430, 37.440 FFDK. 37.430, 37.440 FFD-TM. 40.390, 40.400 FDRS, FDS. 40.390, 40.400 FDK, FDRK. 40.390, 40.400 FDARS, FDAS. These charges must be paid by the recipient. We have no control over these charges and cannot predict what they might be. Items Must be Unused and Packaged Appropriately. If item received is not as described in description. All products are examined carefully before dispatch. The item "New original DOLZ M642 DOLZ Water pump OEM" is in sale since Thursday, July 12, 2018. This item is in the category "Vehicle Parts & Accessories\Car Tuning & Styling\Engine, Tuning & Chips\Performance Pistons & Rings". The seller is "mservice_007" and is located in Kaunas. This item can be shipped worldwide.